Wilkes County | Scuffalong: Genealogy. 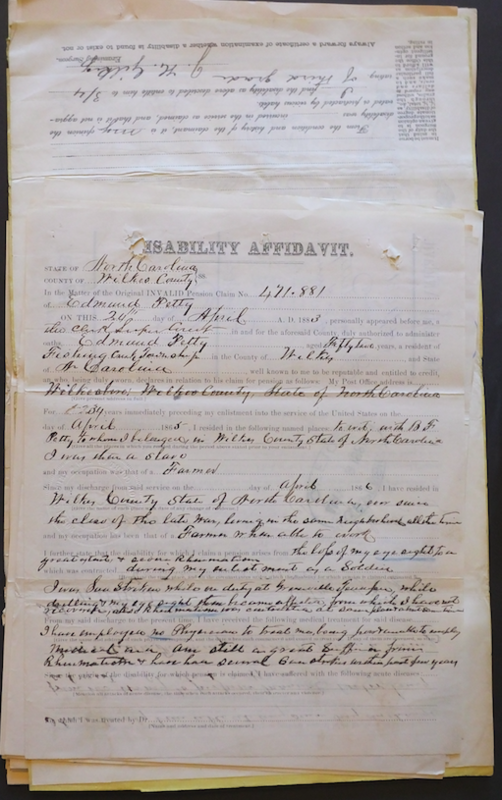 Wilkes County – Scuffalong: Genealogy. As detailed here, Edmond Petty was Eva Petty Walker‘s grandfather. Petty was born enslaved in the 1830s, probably in Wilkes County, North Carolina (Iredell County’s northwestern neighbor). On 26 April 1865, he enlisted in Company H, 40th Regiment, United States Colored Infantry, in Greeneville, Tennessee. Intentionally or accidentally, his name was recorded as “Edward Pedy.” (Greeneville is about 120 miles from Wilkes County over the Blue Ridge Mountains through what is now Cherokee National Forest. This is tough terrain even today.) After mustering out in February 1866 at Chattanooga, Edmond Petty returned to Wilkes County, married and reared a family. In poor health and finally straitened, in 1883, Petty applied to the United States government for an invalid’s pension. He claimed disability as a result of suffering a sunstroke while drilling with his regiment. Petty’s disability affidavit provides rich details of his life. Prior to enlistment in the Army, he had lived “with B.F. Petty to whom I belonged in Wilkes County, State of North Carolina. I was there a slave.” (Benjamin F. Petty, who reported owning 23 enslaved persons in 1850, was one of the largest slaveholders in Wilkes County.) Since the war, he had lived in the Fishing Creek area of Wilkes County and had worked as a farmer when he was able. Petty claimed that his diminished eyesight and rheumatism were the result of sunstroke suffered while on duty at Greeneville and that, because of his condition, he was barely able to work. Edmond Petty’s file comprises 84 pages of testimony by his fellow veterans, neighbors and doctors about Petty’s medical condition and its causes, as well as his ability to support himself. Said H.M. Wilder, for example, “I found him hauling wood in a small one horse wagon to the town of Statesville earning a meagre living.” In the end, he was awarded eight dollars a month for three-quarters disability due to rheumatism and one-quarter to heart trouble.The Record & Landmark published a sarcastic piece about Petty’s appeal of his initial pension award in an article that was reprinted across North Carolina’s Piedmont. The piece insinuates that Petty had done nothing to warrant his stipend, but more importantly reveals that Petty was the agent of his own emancipation. When Stoneman’s Raid passed through Wilkes County in late March 1865, capturing Wilkesboro, Petty escaped the Petty plantation and fell in with Union troops as contraband, following them all the way to Tennessee, where he enlisted to fight the Confederacy. Record & Landmark (Statesville, N.C.), 18 March 1898.U.S. Colored Troops Military Service Records, 1863-1865 [database on-line], http://www.ancestry.com; File #471,881, Application of Edmond Petty for Pension, National Archives and Records Administration. On 30 Jan 1905, in Statesville, North Carolina, my great-great-grandfather John W. Colvert married Adeline Hampton. The marriage was performed by J.H. Pressley, the same Presbyterian minister who would marry John’s son Lon and Caroline McNeely a year later. John and Adeline had had four daughters together. Selma Eugenia, Ida Mae, Lillie Mae and Henrietta were born between 1889 and 1893, and I don’t know what kept John and Addie from marrying for so long — or finally induced them to tie the knot. Separate or apart, I’ve found none in the 1900 census. Addie’s whole family, in fact, is elusive in enumeration records. 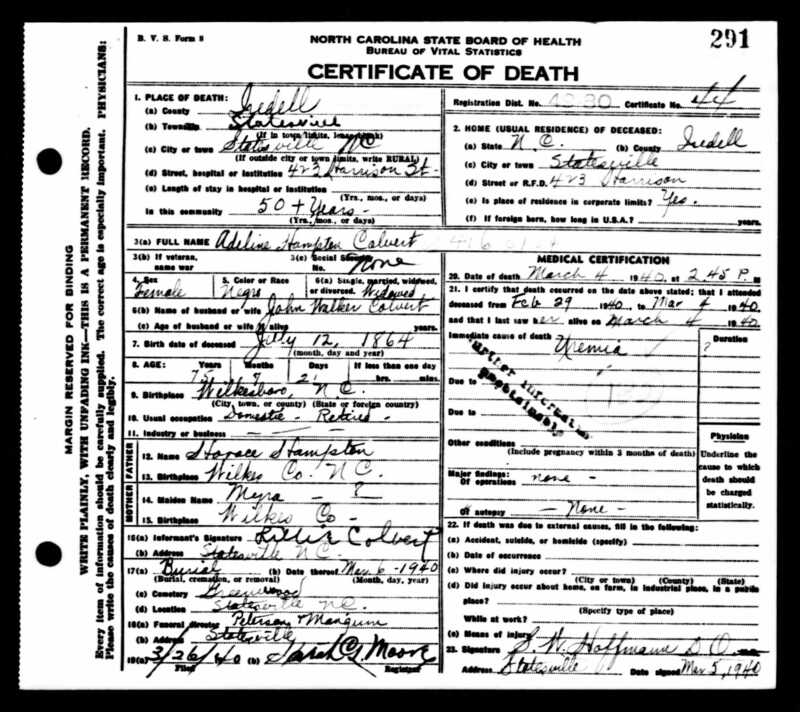 Her marriage license and death certificate reveal that she was born about 1864 in Wilkes County, North Carolina — northwest of Iredell — to Horace and Myra Hampton. (Other death certificates report Myra’s maiden name as Russell.) In the 1880 census of Wilkes, Addie appears in Wilkesboro township with her parents, younger siblings Vance, Josephine and Henry, and nephews and niece Arthur, Horace and Emma Hampton. Ten years earlier, however, in the 1870 census, Horace and Myra cannot be found, and Addie seems to be living in a household headed by much older siblings. 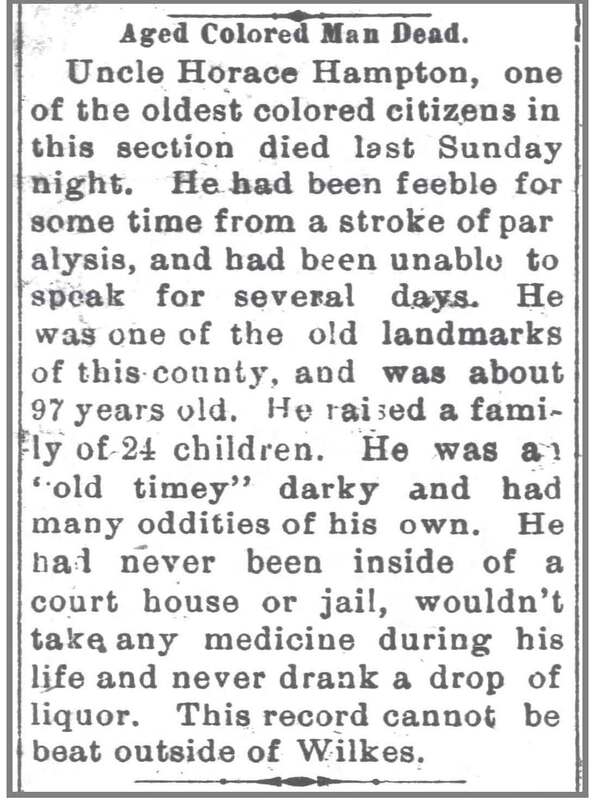 The 1890 census has perished, but Horace Hampton, “the veteran bridge keeper,” appears in a brief congratulatory article in the Wilkesboro Chronicle on the prosperity and good behavior of the county’s colored people. 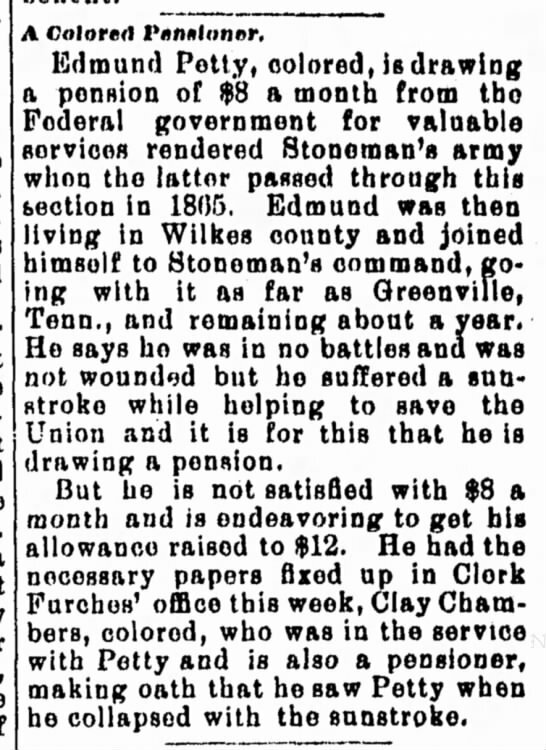 Wilkesboro Chronicle, 14 January 1891. Unfortunately, the family’s next mention is an obituary for Myra Hampton, which reveals a surprising number of siblings for Addie. Most of the children were adults before Emancipation, thus do not appear in census records with their parents. 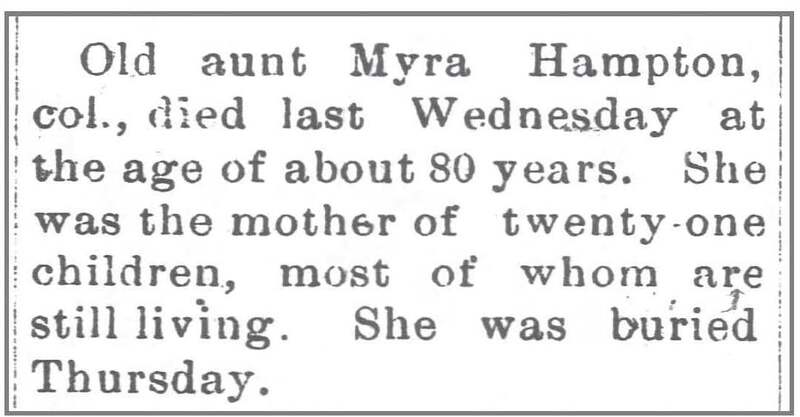 Also, though Myra’s age is given as “about 80,” the 1880 census suggests that she was closer to 70 at the time of her death. Wilkesboro Chronicle, 3 January 1900. Just over a year later, the Chronicle mocked Horace Hampton’s efforts to reclaim his position as bridge tender on the Yadkin River. Wilkesboro Chronicle, 3 April 1901. In June 1905, less than six months after his next-to-youngest daughter finally married the father of her children, Horace Hampton passed away. Wilkesboro Chronicle, 14 June 1905. Adeline “Addie” Hampton Colvert outlived her husband by almost 20 years. She is buried next to him in Green Street cemetery in Statesville.